The Swim Basics program includes three stages for school-age kids: Stage 1 Water Acclimation, Stage 2 Water Movement and Stage 3 Water Stamina. The Swim Strokes program includes three stages for school-age kids: Stage 4 Stroke Introduction, Stage 5 Stroke Development and Stage 6 Stroke Mechanics. My child isn’t yet able to swim halfway across the Y pool (12.5 yards) on their front and back without a flotation device. My child is able to swim halfway across the Y pool (12.5 yards) on their front and back without a flotation device. In this program, school-age kids learn personal water safety and achieve basic swimming competency by learning two benchmark skills—swim, float, swim and jump, push, turn, grab. Kids develop comfort with underwater exploration and learn to safely exit in the event of falling into a body of water. This class is for kids who aren’t yet comfortable going underwater voluntarily. Kids focus on body position and control, directional change, forward movement in the water and continue to practice how to safely exit in the event of falling into a body of water. This class is for kids who aren’t yet able to do a front and back float on their own. Kids learn how to swim to safety from a longer distance than in previous stages. The class also introduces rhythmic breathing and integrated arm/leg action. This class is for kids who aren’t yet able to swim 10-15 yards on their front and back. 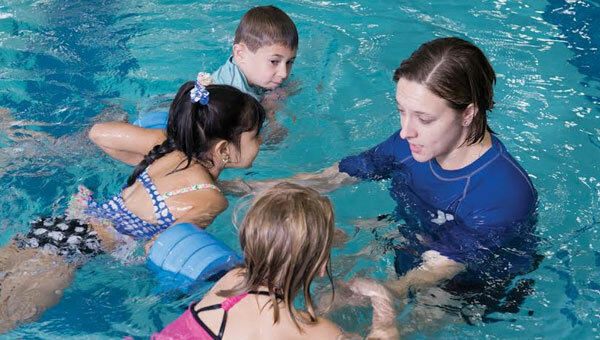 Having mastered the fundamentals, school-age kids learn additional water safety skills and build stroke technique. Kids learn the front crawl, back crawl, breaststroke kick and butterfly kick. This class is for kids who aren’t yet able to swim 15 yards of front and back crawl. Kids work on stroke technique and learn the major competitive strokes. This class is for kids who aren’t yet able to swim the front crawl, back crawl and breaststroke across the pool. Kids refine stroke technique on the major competitive strokes, learn about competitive swimming and discover how to incorporate swimming into a healthy lifestyle. This class is for kids who aren’t yet able to swim the front crawl, back crawl and breaststroke across the pool and back.